We’d love your help. 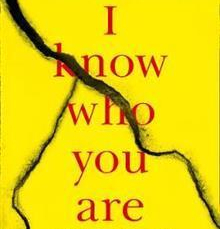 Let us know what’s wrong with this preview of I Know Who You Are by Alice Feeney. l Know Who You Are is the brilliant tale of two stories. One is about Aimee Sinclair—well-known actress on the verge of being full-on famous. If you saw her, you’d think you knew her. One day towards the near-end of her shoot on her latest film, Aimee comes home from filming to find her husband’s cell phone and wallet on the dining room table. He never goes anywhere withou l Know Who You Are is the brilliant tale of two stories. One is about Aimee Sinclair—well-known actress on the verge of being full-on famous. If you saw her, you’d think you knew her. One day towards the near-end of her shoot on her latest film, Aimee comes home from filming to find her husband’s cell phone and wallet on the dining room table. He never goes anywhere without them. But he’s nowhere to be found. She’s not too concerned—they had a huge fight the night before. They both said things they didn’t mean. He might have done things he didn’t mean, things she can’t forget. Even though she has a history of supposedly forgetting. After all, she’s a very good actress. 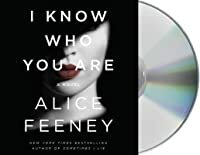 Enter for a chance to win one of 20 unabridged AUDIOBOOK CDs of Alice Feeney's I KNOW WHO YOU ARE, read by Stephanie Racine! To ask other readers questions about I Know Who You Are, please sign up. 4 Crazy Unbelievable Stars! Thank you to #Goodreads-Giveaway, Flatiron Books and Alice Feeney for a copy of this ARC! Alice Feeney sure knows how to give a person heart palpitations - you know, the kind that make you feel like your heart is going to burst out of your chest and rise right up out of you? Yeah, those. Aimee Sinclair is an actress everyone thinks they know but can’t remember where from. Someone, however knows Aimee very well, perhaps even better than she knows 4 Crazy Unbelievable Stars! Thank you to #Goodreads-Giveaway, Flatiron Books and Alice Feeney for a copy of this ARC! Aimee Sinclair is an actress everyone thinks they know but can’t remember where from. Someone, however knows Aimee very well, perhaps even better than she knows herself and they know exactly what she’s hiding. Tsk Tsk Aimee..
Aimee is used to playing a role, who knew that she’d have to play one, day in day out, whether she was onscreen or off? Her life is about to be turned upside down in an instant. Bad things always happen to Aimee Sinclair. Who is to blame? Is it her fault or someone else’s? If only these questions were that easy to answer! Oh what fun! This is a psychological suspense that left me breathless, my heart all aflutter. Whatever you think this is, I can assure you, you’re wrong. Back and forth I went attempting to guess which way was up, close I came I tell ya, but ha, no cigar. “I Know Who You Are” is a worthy follow up to Alice Feeney’s debut “Sometimes I Lie” which was one of my favorite reads of 2017. With her sophomore novel, Feeney most definitely knocks it out of the park yet again. This is a MUST-READ my friends! Do not deter, get your hands on a copy as soon as possible! Published on Goodreads on 1.1.19. To be published on Amazon and Twitter on release date in April 2019. Sometimes a book immediately resonates, and you know you’re in for a great ride! This was one of those books! Aimee is an up-and-coming movie starlet! Everything is falling into place for her...at least professionally. Her home life however, could use a little Hollywood magic. Her husband has grown distant as her star-power has risen, leaving him in the shadows. After a long day of shooting on the set, Aimee returns home to find her husband missing. His wallet, phone and shoes still in the home. Sometimes a book immediately resonates, and you know you’re in for a great ride! This was one of those books! After a long day of shooting on the set, Aimee returns home to find her husband missing. His wallet, phone and shoes still in the home. Car parked in the garage, and most disturbing, a bouquet of flowers on the table with a simple note that chillingly says, “Sorry”. The present: Aimee trying to hold her life together, desperate to figure out what happened to her husband. He couldn’t have simply left on his own...not without all his belongings. Right? The past: An innocent six years old girl trusting the wrong person - when the unimaginable happens. Throughout this story Aimee holds her own inner-dialogue which, if done correctly, can absolutely make the book! And Alice Feeney did it to perfection! It puts you deep in the mind of the character! Loved it! Alice Feeneys’ previous book Sometimes I Lie, was a favorite of mine last year. Now with her latest follow up, I’m even a bigger fan! OK Ms. Feeney, the pressure is on! What do you have in store for us next? Personally...I cannot wait! Thank you to Susanne for gifting me her ARC.. I read Alice Feeney’s other book “Sometimes I Lie” which was a 5 star rating from me, so I had high hopes for this book!! Aimee Sinclair is an actress married to Ben, when she returns home from her daily jog she discovers that Ben has disappeared leaving his wallet, shoes, phone and coat behind. Aimee is used to acting the part and seems to be hiding a big secret!! The police suspect her of harming Ben as they have video evidence of them arguing in a restaurant and her slapping him in the face. S I read Alice Feeney’s other book “Sometimes I Lie” which was a 5 star rating from me, so I had high hopes for this book!! Aimee is used to acting the part and seems to be hiding a big secret!! The police suspect her of harming Ben as they have video evidence of them arguing in a restaurant and her slapping him in the face. She must prove her innocence and find out who is stalking her. Told over 2 timelines 2017 and 1998, we discover who Aimee really is and why she becomes so illusive. A must read book. I cannot wait to see what Alice Feeney comes up with next - I have become a massive fan!! I started reading I Know Who You Are on 3/10/2019 and finished it on 3/14/2019. This book is an excellent read. I like the distinction between the voice of an adult Aimee and the voice of a five year old Aimee. I like following adult Aimee’s thought process because there are many good advices especially because she’s an insecure person. The kid Aimee reminds me of a children’s series called Amelia Bedelia where she doesn’t know the idioms of such things as hold your horses as in wait a moment in I started reading I Know Who You Are on 3/10/2019 and finished it on 3/14/2019. This book is an excellent read. I like the distinction between the voice of an adult Aimee and the voice of a five year old Aimee. I like following adult Aimee’s thought process because there are many good advices especially because she’s an insecure person. The kid Aimee reminds me of a children’s series called Amelia Bedelia where she doesn’t know the idioms of such things as hold your horses as in wait a moment instead of actually holding a horse. I like the surprise point of view when the past meets the present. The kid Aimee’s thinking process is interesting to follow too. I like that she tries to hold on to remembering who she is despite her being under the circumstances. This book is told in the first person point of view following Aimee as she tells readers how lying is what she does best. She’s an actress. She and her husband, Ben has an up and down relationship. Last night they had a fight and Aimee asked for a divorce. The next day after she comes home from work, she finds her husband gone. His wallet, phone, and car keys are at home but he’s nowhere in sight. The story slowly unraveling about their unstable marriage and Aimee’s equally unstable childhood. Each chapter switches between past Aimee starting when she was five and current Aimee as police investigate the whereabouts of her husband. Aimee also has claims of a stalker that warns her he/she knows who Aimee is but the detective doesn’t seem to take it seriously. 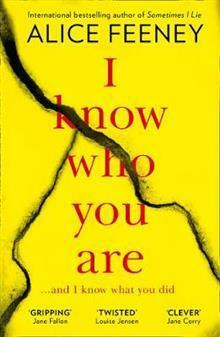 I Know Who You Are is very well written and a fast paced read. This book keeps me up many nights and I couldn’t put it down. I like the surprise new point of view, but the twist, though unexpected was not my favorite part to read. I don’t understand why that happens because Aimee has such fond memories of what little she had. I’m surprise that she’s happy with what she ended up with in the end, yes she wanted that, but even she can tell it’s just not right. But then lies is what she does best, so what’s with another one. I would have liked if Maggie has a POV of her own. I’m interested to know what she’s thinking. Some chapters are hard to put down than others because of those mini cliffhangers. Overall, the book is still a great read and I do recommend everyone to read it. ***Disclaimer: Many thanks to Flatiron Books for the opportunity to read and review. Please be assured that my opinions are honest. Feeney's style is so unique and she knows the best way to impress us, her new book I KNOW WHO YOU ARE is a perfection full of unexpected dark twists and great drama! You can tell when a psychological thriller is great when you have no clue what's going on or who's doing what! Alice is the best when it comes to thrillers and we have enjoyed her book so much! She has merged different topics in very mixed and difficult emotions to swallow, her way of elaborating the acts is so greaf written it make Feeney's style is so unique and she knows the best way to impress us, her new book I KNOW WHO YOU ARE is a perfection full of unexpected dark twists and great drama! You can tell when a psychological thriller is great when you have no clue what's going on or who's doing what! Alice is the best when it comes to thrillers and we have enjoyed her book so much! She has merged different topics in very mixed and difficult emotions to swallow, her way of elaborating the acts is so greaf written it makes you understand everything, we love her style of writings because it makes her books so complete! The book is terrifying and creepy, and it starts with Aimee, the book talks about her present days when she is becoming a famous actress but also it includes and her husband's missing and it alternates in her past days of her life bringing too many conclusions and concepts that will shock you! Every page has a thrill which makes you believe in Aimee and the other ones make you not to! I really enjoyed the intrigue between the lines because it was so compulsive! Woot! I'm a winner! Thanks, Goodreads! I NEED IT, I NEED IT!! We've got a whole 384 days to wait for this novel!! I can't wait that long!! This is a tale of two stories. One is about Aimee Sinclair - a well known actress who is on the verge of becoming famous. One day towards the end of her shoot on her latest film, Aimee comes home from filming to find her husbands mobile phone and wallet on the dining room table. He never goes anywhere without them. When she goes to her favourite coffee shop the next morning, her card gets declined. The bank tells her that her account has been emptied. She suspects her husband but the bank says t This is a tale of two stories. One is about Aimee Sinclair - a well known actress who is on the verge of becoming famous. One day towards the end of her shoot on her latest film, Aimee comes home from filming to find her husbands mobile phone and wallet on the dining room table. He never goes anywhere without them. When she goes to her favourite coffee shop the next morning, her card gets declined. The bank tells her that her account has been emptied. She suspects her husband but the bank says that it was Aimee who withdrew the money. Alternating with Aimee's story is that of a little girl who wandered away from home. This is one twisted roller coaster ride you won't want to get off. The story is told from the present day where Aimee is an actress, to the past when she was just six years old. This is another book where you can't say too much about as it would give away far too many spoilers. I kept telling myself just one more chapter then I must get things done, but I could not put it down as there were so many cliff hangers at the end of the chapters. There were parts that made me feel sick to my stomach though. Louise Wilson Thank you, Cheri 😊 me too, especially when one chapter is never enough!! Louise Wilson Thank you, Luvtoread 😊 I think you'd enjoy this one!! Oh man does Alice Feeney know how to keep her readers fully engaged! That was one twisted wild ride and I could not get off. Alice Feeney's writing is addictive and it must be said that she is the queen of cliffhangers. It is next to impossible to pause at the end of a chapter and expect to be reading late into the night. This story is told via the alternating inner monologue of our main character, Aimee Sinclair. From the present day where she is a upincoming actress, to the past where she is a Oh man does Alice Feeney know how to keep her readers fully engaged! That was one twisted wild ride and I could not get off. Alice Feeney's writing is addictive and it must be said that she is the queen of cliffhangers. It is next to impossible to pause at the end of a chapter and expect to be reading late into the night. This story is told via the alternating inner monologue of our main character, Aimee Sinclair. From the present day where she is a upincoming actress, to the past where she is a six-year-old runaway who makes the poor decision of instilling her trust in a stranger. Each chapter seamlessly flowed—even with the change in time period—and is one of the many aspects of Alice's writing that I enjoy so much. I feel doing so really offers a reader a grander insight on a character, and character development is yet another area where Alice scores highly. There were moments in the chapters where Aimee as a child that are a bit hard to swallow and provoked feelings of sorrow in me. It's important to note that these inclusions may be a trigger for some. Since becoming a mother, I have had significant trouble reading anything that involves harm—small or large—to children. BUT I don't know if it’s because Alice Feeney has quickly become one of my favorite authors, or if it was the manner in which she delivered this sensitive topic... but overall, I was able to easily stomach it. What I can tell you is expect the unexpected. Such as Alice's debut, Sometimes I Lie, if you think you have this one figured out, you betcha you are likely dead wrong. I don't know how she does it, but Alice you are a master of your craft and I always look forward to what you come up with next. One word my friends: PREORDER. This is yet another book not to sleep on in 2019! "Ignorance isn’t bliss; it’s fear postponed to a later date." "You can’t allow the past to steal your present, but if you siphon off just the right amount, it can help fuel your future." "Sometimes self-preservation means staying away from the people who pretend to care about you." My eternal gratitude to Flatiron Books and Alice Feeney for gifting me a copy of this novel. Thanks to Flat Iron Books for the ARC! This was one hell of a ride. I was enjoying the hell out of this book and had so many predictions and every single chapter ended on a cliffhanger and I thought it was excellent.. until that final plot twist. This book follows an actress named Aimee Sinclair who’s husband has recently gone missing, and their shared bank account has been emptied. In alternating chapters we get flashbacks of Aimee’s horrific childhood (view spoiler)[where she was kidnapped by t Thanks to Flat Iron Books for the ARC! This book follows an actress named Aimee Sinclair who’s husband has recently gone missing, and their shared bank account has been emptied. In alternating chapters we get flashbacks of Aimee’s horrific childhood (view spoiler)[where she was kidnapped by these delusional psychos named Maggie and John (hide spoiler)]. This book was packed with so many cliff hangers and plot twists which made it very hard to put down and very enjoyable to read. Thanks so much to Flatiron #partner for gifting me a copy of I Know Who You Are by Alice Fenney. I loved Sometimes I Lie last year so I had to get my hands on this one! And WOW, what a WILD ride. Once again, I am kind of stuck on how to write a review for one of Feeney’s novels so I don’t spoil anything. Just when you think you know what’s going to happen, you get slapped in the face with a shocking surprise. Seriously. My mouth dropped open. Aimee Sinclair is an actress. Not just an actress in Thanks so much to Flatiron #partner for gifting me a copy of I Know Who You Are by Alice Fenney. I loved Sometimes I Lie last year so I had to get my hands on this one! And WOW, what a WILD ride. Aimee Sinclair is an actress. Not just an actress in movies, she has also been acting all her life. One night after rehearsals, Aimee comes home to find her house empty. Her husband, Ben, is gone. They had a huge fight the night before so she’s worried he’s left. She gets even more worried when she finds his phone, wallet and coat all in the normal places. Ben would never leave the house with his phone or wallet. Where has he gone? Aimee then decides to contact the police. Okay, enough rambling. I’m not telling you a thing besides BUY THIS BOOK in April! Oh Wow, this is one of the best psychological suspense books I have read in a while I absolutely adored this. My first experience with this author and I am super impressed. I don't really want to say too much about this story because I think it's just best to just delve into this blind, No preconceptions or expectations, just dive on in and prepare to have your mind blown. So Aimee an upcoming actress arrives home to find her husband missing, all his belongings are still at home his car, phone, personal effects. Apparently, shes also closed there joint account and withdrew the £10.000 that was in it but she has no recollection of this at all. To further muddy the waters Aimee and Ben had a violent disagreement the evening before his disappearance. Slowly Aimee's Life stars to implode as everything around her starts to disintegrate its one disaster after the other and all possible avenues lead solely back to her. So this is told completely from Aimee's POV and as the story unfolds we get to witness events from two separate time frames. It becomes very apparent that Aimee's unconventional turbulent childhood has shaped her somewhat into the woman she is today and that person we learn through these flashbacks has not had an easy ride. Aimme is a woman of deep secrets and she keeps her card close to her chest not trusting the people around her to have her back. Despite her character flaws, I liked her she seemed human and though she had a darker side I still believed at heart she wanted to do the right thing. So this definitely managed to keep my attention I was absolutely enthralled throughout and I actually read this in one sitting I was that invested in the outcome. And that plot twist!!! my god that literally came out of left field and totally blew my mind. Didn't see that one coming at all and that doesn't happen very often with me. "I Know Who You Are" would be fantastic on the big screen. This was such a twisty thrilling journey that I enjoyed immensely and this is one book I recommend really highly. I voluntary reviewed a copy of "I Know Who You Are"
Actress Aimee Sinclair returns home from her daily run and quickly becomes alarmed when she realizes her husband Ben is missing but his belongings are left behind. With a secretive past, dramatic memory loss and a possibly dangerous stalker, Aimee becomes the prime suspect in her husband's disappearance. She must quickly piece together the puzzle in order to prove her innocence while continuing to hide her true identity leading readers to a wildly shocking conclusion. A tightly woven, intricately plotted, heart-in-your-throat thriller, I couldn’t put this book down! I Know Who You Are is expertly crafted and tightly plotted. I never once guessed the end – and that is something of a feat for me! Every time I thought I knew what would happen, Feeney would upend everything so I was right back to square one. This thriller follows Aimee Sinclaire, a woman who is an actress for her career, but has also spent her entire life acting. She’s used to playing a role, but A tightly woven, intricately plotted, heart-in-your-throat thriller, I couldn’t put this book down! I Know Who You Are is expertly crafted and tightly plotted. I never once guessed the end – and that is something of a feat for me! Every time I thought I knew what would happen, Feeney would upend everything so I was right back to square one. This thriller follows Aimee Sinclaire, a woman who is an actress for her career, but has also spent her entire life acting. She’s used to playing a role, but one day her life is turned upside down and she’s suddenly in the role of her life. Told in alternating timelines between 2017 and 1987, I Know Who You Are sees Aimee come home to find her husband’s cell phone and wallet on the dining room table, but he’s nowhere to be found. Considering they got in a huge fight the night before, Aimee is the first suspect. Aimee Sinclair.. a woman on the verge of becoming a very famous actress as well she should be considering her whole life has been pretending to be someone else. Acting and lying come more naturally to her than breathing. But one day her husband After I read Sometimes I Lie last year and LOVED it, I was beyond thrilled to get a copy of her sophomore book, I Know Who You Are and guess what... it's JUST AS GOOD! Dang, Feeney.. now I'm dying for the next one and see if we can go three for three! Do you know what I want for Christmas? I want every single amazing book that is going to be published in 2019. UMM.. CAN I GIVE THIS MORE THAN 5 stars?!!?!?? THIS BOOK IS GOLD! Twists of ALL twists! Seriously, Alice Feeney – how do you even write books like this?! I’m telling you all – if you were a fan of "Sometimes I Lie", get ready to be blown away by this spectacular thriller. Feeney does NOT let us down!!!! I can’t even say anything more, besides: PRE-ORDER, PRE-ORDER, PRE-ORDER! This is a DARK (warning! ), enthralling, thriller that will knock you of UMM.. CAN I GIVE THIS MORE THAN 5 stars?!!?!?? I can’t even say anything more, besides: PRE-ORDER, PRE-ORDER, PRE-ORDER! This is a DARK (warning! ), enthralling, thriller that will knock you off your seat when you finish. Thank you FLAT IRON BOOKS for my review copy! This is one of the bests of the BESTS! Out 4/23/19 – PREORDER NOWWWWWWW! I loved Sometimes I Lie because I do love a terribly twisted read, so was happy to get my hands on I Know Who You Are and I wasn’t disappointed, this one is as twisty as you like. We follow along with Aimee, an actress just on the edge of super stardom, who comes home one day to find her husband missing. The police are strangely immediately suspicious of Aimee and as things unfold we find out why…. Alice Feeney plots with a clever eye on character and event which keeps things off kilter and means I loved Sometimes I Lie because I do love a terribly twisted read, so was happy to get my hands on I Know Who You Are and I wasn’t disappointed, this one is as twisty as you like. Alice Feeney plots with a clever eye on character and event which keeps things off kilter and means you are genuinely unsure where things will go. Pacy prose and fascinating characters add to the mix and this is a book easily devoured in one sitting. With a fully fledged spot on finale and a beautifully twisted central mystery, I Know Who You Are means Alice Feeney goes onto my must read list. There are unreliable narrators, and then there's Aimee Sinclair. Aimee doesn't even know if she can trust her own memory. And that's unfortunate, because her husband is missing, and Aimee is the number one suspect. This book is bananas. There are so many twists I feel like I have whiplash. One of the many twists was a bit confusing as far as the details are concerned, but there is so much happening in this book that you sort of just forget that you question anything. I was drawn in to Aimee's st There are unreliable narrators, and then there's Aimee Sinclair. Aimee doesn't even know if she can trust her own memory. And that's unfortunate, because her husband is missing, and Aimee is the number one suspect. This book is bananas. There are so many twists I feel like I have whiplash. One of the many twists was a bit confusing as far as the details are concerned, but there is so much happening in this book that you sort of just forget that you question anything. I was drawn in to Aimee's story early, and I really felt for her as a child. The story alternates between her life as a six-year-old and current adult Aimee who has grown up and become a somewhat successful actress. The main issue I had with the story is that everything that happens to child Aimee makes adult Aimee annoying. She's an actress, but she literally has no confidence in herself. I feel like that's a huge roadblock for someone in her profession, and it's hard to understand how Aimee has achieved even a modicum of success. She also makes some increasingly odd and questionable decisions. Aimee's husband is missing, and the police are keeping close tabs on her, but she just goes about her life as if it's business as usual. I’m not impressed with the writing, it was really simple and I found myself skimming a lot. Another distorted family, abuse, psycho thriller. Yes, it was twisty, but not necessarily a pleasurable read. At least not for me. Wow. Need to discuss this book with someone!! Read it when it comes out! What a crazy thriller!! Thanks to Flatiron Books for the Advance Readers Copy. I knew after absolutely loving Sometimes I Lie by Alice Feeney (@alicewriterland), that I wanted to get my hands on her upcoming release, I Know Who You Are. And man oh man did this one deliver. Wow. I was trudging along with this one, thinking I was so clever and had it all figured out just to be completely mind blown by the ending.🤯 On top of that, this book has a dual timeline format and Feeney was brilliant with her chapter transitions. 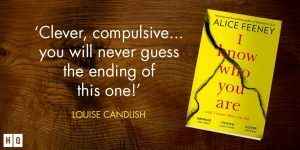 You’ll just have to read it to know what I’m talking ab I knew after absolutely loving Sometimes I Lie by Alice Feeney (@alicewriterland), that I wanted to get my hands on her upcoming release, I Know Who You Are. And man oh man did this one deliver. Wow. I was trudging along with this one, thinking I was so clever and had it all figured out just to be completely mind blown by the ending.🤯 On top of that, this book has a dual timeline format and Feeney was brilliant with her chapter transitions. You’ll just have to read it to know what I’m talking about. This thriller genre novel is a dark, gripping read that I couldn’t stop reading. This is the shortest time, ever, that I have read a novel. I was reading as I ate breakfast and anytime I had that I could get to read, I was absorbed in these pages. I read this book as a buddy read with @booksonthebookshelf. This book is made up of two stories and the chapters alternate between 1987-1988 and 2017. The alternating time between chapters was written seamlessly as to keep the flow of the novel. Aimee Sin This thriller genre novel is a dark, gripping read that I couldn’t stop reading. This is the shortest time, ever, that I have read a novel. I was reading as I ate breakfast and anytime I had that I could get to read, I was absorbed in these pages. Aimee Sinclair is what we readers like to call an unreliable narrator and if you like this in a novel with plenty of plot twists, then I recommend this book to you. The author left little clues and I had the ending partially figured out, but then at the last second there is a big plot twist and things aren’t exactly what I had thought. Holy smokes! What land of the unknown did I just travel too?! Alice Feeney will have you wondering just how good actresses can become when you meet the star actress of her newest work Aimee. My word Aimee is one of those characters you can't quite understand fully but her emotions keep you on your toes with plenty of heart palpitations and anxiety to follow up. Look fight or flight is not meant to be a stationary every day feeling yet for her and Ben it has been especially now that he's gone. Oh! OO Holy smokes! What land of the unknown did I just travel too?! Oh! OOPS! YES he disappeared leaving a cell phone and wallet behind but little else. Where the hell is he and what is he up too? This is one of those crazy books that has you flopping between time lines to her past childhood abuse from 1987 to present 2017 stalkers. When her account is emptied she assumes it's her husband but the bank noted it was emptied by HER! Hang on for this wild ride folks! This was true magic by Alice Feeney and I'm so grateful for her publisher for providing me this ARC through Goodreads Giveaway. Thank you Flatiron Books for sending me an ARC of this crazy new thriller. I really enjoyed "Sometimes I Lie," though I kept my review sparse in order to avoid spoiling any of the fun twists and turns. In this case, I'm going to address at least one of the many cuckoo-bananas reveals in Feeney's latest because while certainly interesting in its dark twist, it was one that made my stomach churn. I loved the atmosphere of this book. Everyone has shadowy Thank you Flatiron Books for sending me an ARC of this crazy new thriller. I loved the atmosphere of this book. Everyone has shadowy motivations, running a wide range from professional jealousy to replacing a missing daughter. As the story gets teased out in alternating chapters taking place in 2017 and the late 1980s, it's a tense escalation of details building up to trying to understand why newly famous actress Aimee is who she is, and why her husband is missing. I most definitely did not expect any of the reveals. And I love thrillers and mysteries that knock me for a loop, especially when at this point in my readership I'm pretty good at sussing out the the why's and who's in the "whodunnits." So I'm appreciative of that aspect of the reading experience. All that being said, I love the way Alice Feeney writes and I think she has a deft hand with a mystery, so I'll definitely be looking forward to any new books in the future. Holy bananapants book friends!!!! (word credit goes to Liberty @franzencomesalive) This book is CRAY. I’m suffering from massive whiplash from all the twists and turns in this wild story. I think I need to soak in an Epsom salt bath from all the body wounds. I feel used and abused. This is best going in blind. If you’ve read Sometimes I Lie, Alice Feeney’s debut, you know that she is the master of keeping you on your toes. I was so frustrated that I couldn’t figure out her last book and she DID I Holy bananapants book friends!!!! (word credit goes to Liberty @franzencomesalive) This book is CRAY. I’m suffering from massive whiplash from all the twists and turns in this wild story. I think I need to soak in an Epsom salt bath from all the body wounds. I feel used and abused. This is best going in blind. If you’ve read Sometimes I Lie, Alice Feeney’s debut, you know that she is the master of keeping you on your toes. I was so frustrated that I couldn’t figure out her last book and she DID IT AGAIN!! AHHH how does she do it?! Aimee is either one amazing actress or I’m just a damn fool. After her husband goes missing the police begin to suspect her and the past comes back to haunt her. Is Amy telling the truth? Is she innocent? Guilty? Insane? I had NO idea. Alice has lived in London and Sydney and has now settled in the Surrey countryside, where she lives with her Alice Feeney is an author and former BBC journalist. Her debut novel, Sometimes I Lie, was a New York Times and international bestseller. It has been translated into over twenty languages, and is being made into a TV series by Ellen DeGeneres and Warner Bros. starring Sarah Michelle Gellar.